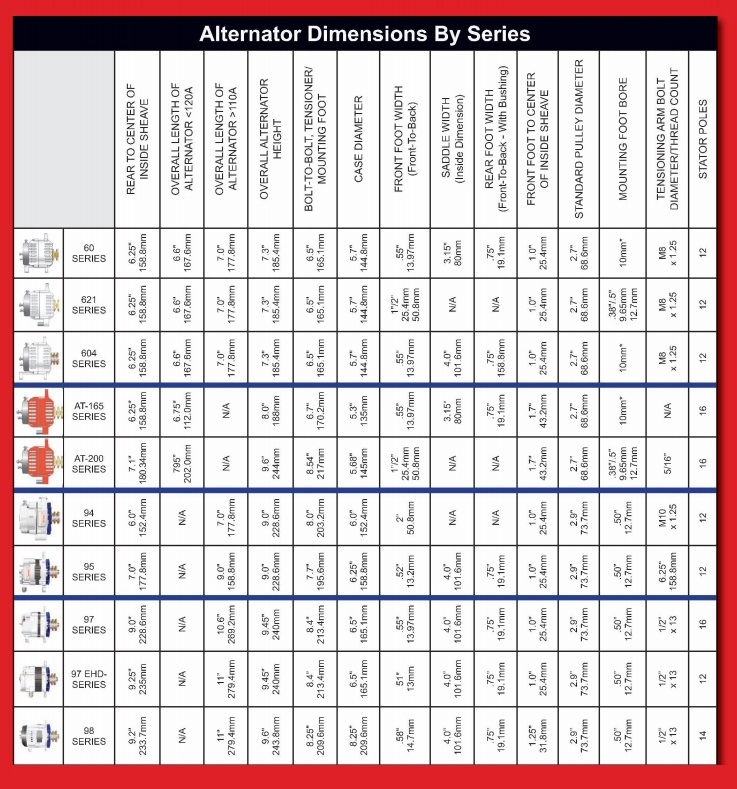 Alternators come in four basic mounting types, there are also some variations on these four types. The single 1" mounting foot is often known as a Motorola style mount and is used on many (but not all) engines by Hino, Lehman, Caterpillar, Atomic 4, Universal, Ford, Crusader, Pathfinder, Westerbeke and any other Motorola equipped engines. The single 2" mounting foot is often known as a Delco style mount and is found on many (but not all) engines by Volvo, Volvo-Penta, Cummins, Westerbeke, Perkins, Mercruiser, Yanmar 6LP (only), GM, and any other Delco equipped engines. The Yanmar 3.15" mount is found (of course) on Yanmar as well as Mercruiser, Lehman, Perkins-Sabre and Hitachi equipped engines. 3.15" is the internal dimension between the two mounting feet. The 4" ID saddle mount is also known as the J-180 mount and is found on larger engines such as Detroit Diesel, Cummins, Caterpillar, and John Deere. 4" is the internal dimension between the two mounting feet. If you found that your engine showed up in more than one category that is of course just to confuse you. Westerbeke managed to show up in almost every category, in fact the only thing for sure about a Westerbeke alternator is that it is going to be red. Small Westerbeke engines often have alternators with dual foot mounts where the feet are closer together than 3.15" The bottom line is that you have to look at what you have, but hopefully this guide will help you.